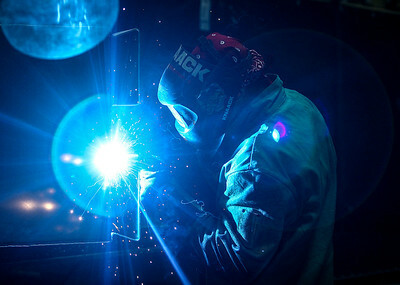 Sarah Nader- snader@shawmedia.com A welder works at Knaack Manufacturing while engineering students from Woodstock and Woodstock North High School watch on while touring the Crystal Lake plant Friday, May 2, 2014. After the tour the students attended a Q&A where a panel of employees from Knaack spoke to the students about what their jobs are all about. 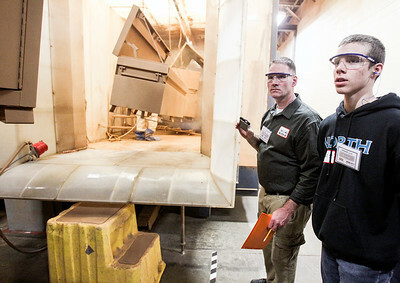 Sarah Nader- snader@shawmedia.com Materials Manager Mark Friedrichs (left) talks about the manufacturing process at Knaack Manufacturing while Woodstock North students, Zac Emricson, 15, William Taylor, 15 and Cassandra Christisom, 15, tour the Crystal Lake plant Friday, May 2, 2014. After the tour the eight students attended a Q&A where a panel of employees from Knaack spoke to the students about what their jobs are all about. 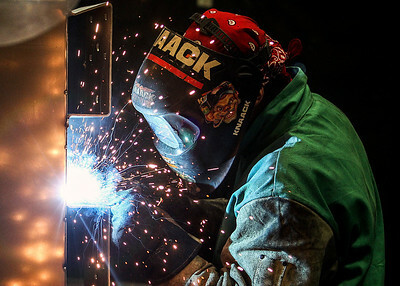 Sarah Nader- snader@shawmedia.com Materials Manager Mark Friedrichs (left) talks about the manufacturing process while Woodstock North student, Joshua Powel, 15, watches welders while on a tour of the Knaack Manufacturing plant in Crystal Lake Friday, May 2, 2014. After the tour the eight students attended a Q&A where a panel of employees from Knaack spoke to the students about what their jobs are all about. 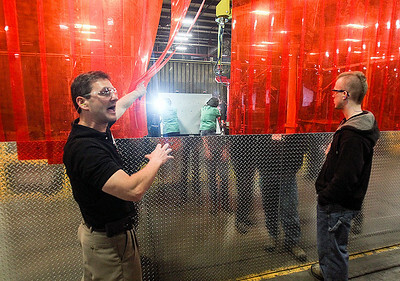 Sarah Nader- snader@shawmedia.com Engineering teacher Jason Huber (left) and Woodstock North student, William Taylor, 15, watch the painting process while one a tour of the Knaack Manufacturing plant in Crystal Lake Friday, May 2, 2014. After the tour the eight students attended a Q&A where a panel of employees from Knaack spoke to the students about what their jobs are all about. Sarah Nader- snader@shawmedia.com A welder works at Knaack Manufacturing while engineering students from Woodstock and Woodstock North High School watch on while touring the Crystal Lake plant Friday, May 2, 2014. After the tour the students attended a Q&A about Knaack Manufacturing where a panel of employees from Knaack spoke to the students about what their jobs are all about. 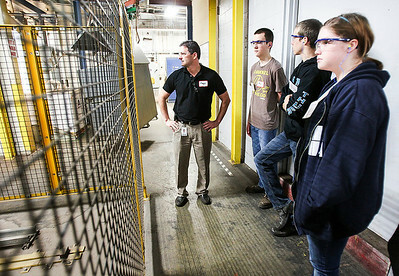 Materials Manager Mark Friedrichs (left) talks about the manufacturing process at Knaack Manufacturing while Woodstock North students, Zac Emricson, 15, William Taylor, 15 and Cassandra Christisom, 15, tour the Crystal Lake plant Friday, May 2, 2014. After the tour the eight students attended a Q&A where a panel of employees from Knaack spoke to the students about what their jobs are all about.